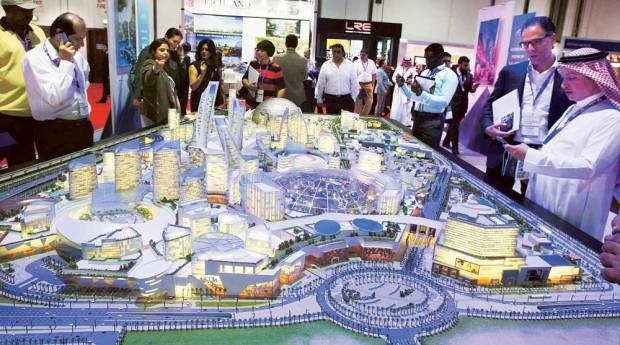 DUBAI: The site for the multibillion dirham Mall of the World — conceived as the biggest ever such destination — has been relocated to an area on Mohammad Bin Zayed Road. The new location has been selected so that the project’s “tourism contribution can be fully realised”, according to a statement from Dubai Holding, the developer. The project — which will integrate extensive shopping with leisure, hospitality and entertainment choices unprecedented in any such development to date — was initially marked for a location off Shaikh Zayed Road. It is where the Police College exists. Last year, it was announced that the Police College would be relocated and the mall would be built there. But, now, the developer believes it would serve the prospects best if it moved to a greenfield site. “The new location will be an outstanding home for the project, as it will allow Dubai Holding to further expand as needed in the future according to market needs,” said Ahmad Bin Byat, vice-chairman and managing director of Dubai Holding. Mall of the World will now undergo extensive planning to become a major retail and leisure destination. The earlier plans had a climate-controlled dome covering to burnish its credential as an all-year round attraction. There were “clusters” that were attached to the mall, with each cluster given over to offering wellness services, hotel accommodation etc. Even in the original plan, Mall of the World was conceived as a multiphase development, with the initial one to be rolled out before 2020. The timeline after the relocation has not been revealed. According to market sources, the decision to relocate spreads Dubai mega-destinations over a wider geography. “In the previous location, MoW had close proximity to Mall of the Emirates and The Dubai Mall,” said an analyst. “But placing it within the Mohammad Bin Zayed Road corridor opens up retail, leisure and entertainment to that part of Dubai. Even prior to the relocation announcement, there was talk that the original plan would have to be resized to fit in with market dynamics and cost expectations. Also, aspects such as the climate-controlled facet over such a massive footprint would have had an oversized impact on the overall project cost. The original location would also have set off intense traffic congestion into and out of the immediate neighbourhoods, it was stated at the time. That too had been a reason for reimagining the mall designs. But now with the relocation, the developer truly gets to start with a clean slate.